Graham's Milk-Vetch is a low spiny shrub very similar to Candolle's Milk-Vetch but with more spreading branches up to 60 cm long. 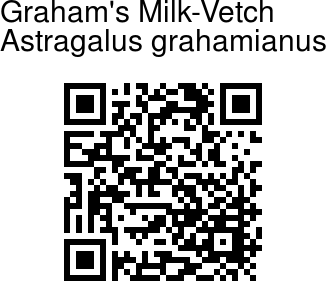 It is named for Edward Graham, who collected specimens in the 1930s, near the Green River in Utah (USA). Leaves are pinnate with 8-14 ovate blunt leaflets with fine-pointed tips, 3.5-7.5 mm long. Flowers are yellow, 2-3 cm long. Flower-stalks are 7.0-8.0 mm long. Calyx is sparsely hairy, with linear lobes. Vexillum is about 2.5-3.2 cm long, panduriform, longer than the wing. Pods are 1.5-1.8 cm long, with silky prostrate hairs, about 18-seeded. 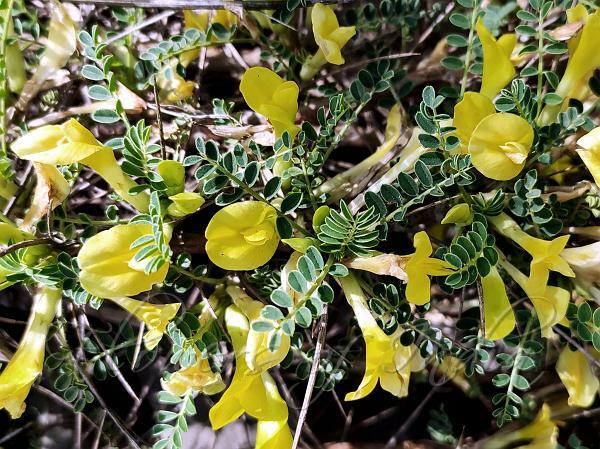 Graham's Milk-Vetch is found in the Himalayas, from Pakistan to Uttarakhand, at altitudes of 1500-3300 m. It is common in Kashmir and Lahaul. Flowering: May-August. Photographed in Lahaul, Himachal Pradesh.